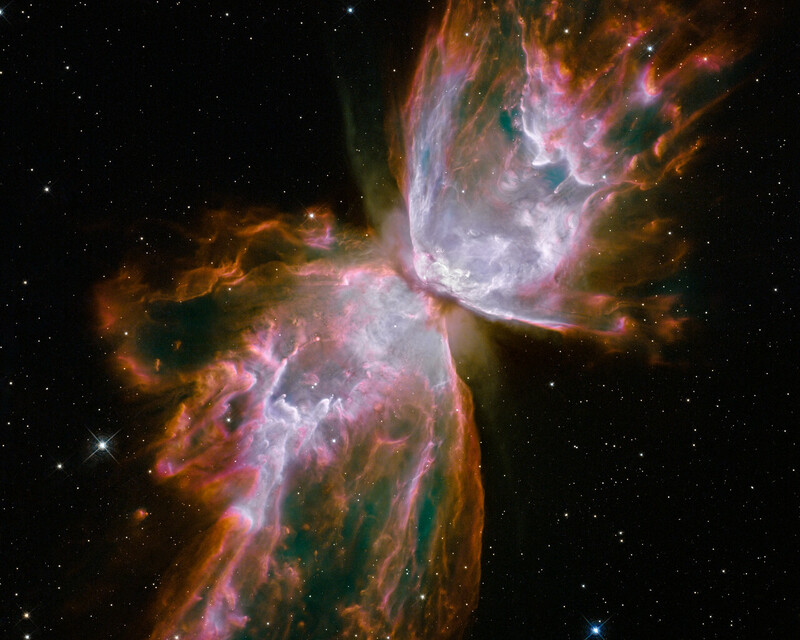 What resemble dainty butterfly wings are actually roiling cauldrons of gas heated to nearly 20 000 degrees Celsius. The gas is tearing across space at more than 950 000 kilometres per hour — fast enough to travel from Earth to the Moon in 24 minutes! A dying star that was once about five times the mass of the Sun is at the centre of this fury. It has ejected its envelope of gases and is now unleashing a stream of ultraviolet radiation that is making the cast-off material glow. This object is an example of a planetary nebula, so-named because many of them have a round appearance resembling that of a planet when viewed through a small telescope. The Wide Field Camera 3 (WFC3), a new camera aboard the NASA/ESA Hubble Space Telescope, snapped this image of the planetary nebula, catalogued as NGC 6302, but more popularly called the Bug Nebula or the Butterfly Nebula. WFC3 was installed by NASA astronauts in May 2009, during the Servicing Mission to upgrade and repair the 19-year-old Hubble. NGC 6302 lies within our Milky Way galaxy, roughly 3800 light-years away in the constellation of Scorpius. The glowing gas is the star's outer layers, expelled over about 2200 years. 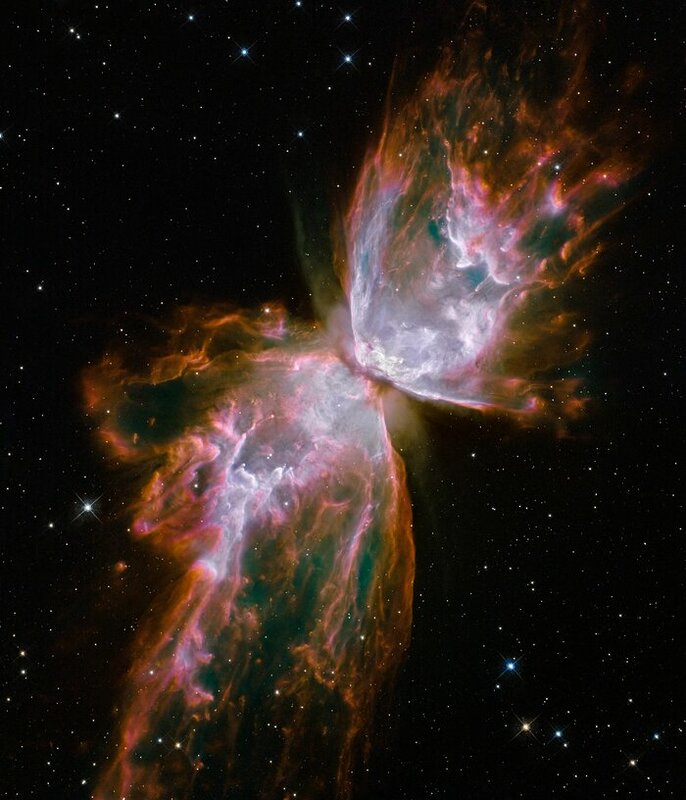 The "butterfly" stretches for more than two light-years, which is about half the distance from the Sun to the nearest star, Proxima Centauri. The central star itself cannot be seen, because it is hidden within a doughnut-shaped ring of dust, which appears as a dark band pinching the nebula in the centre. The thick dust belt constricts the star's outflow, creating the classic "bipolar" or hourglass shape displayed by some planetary nebulae. The star's surface temperature is estimated to be over 220 000 degrees Celsius, making it one of the hottest known stars in our galaxy. Spectroscopic observations made with ground-based telescopes show that the gas is roughly 20 000 degrees Celsius, which is unusually hot compared to a typical planetary nebula. The WFC3 image reveals a complex history of ejections from the star. The star first evolved into a huge red giant, with a diameter of about 1000 times that of our Sun. It then lost its extended outer layers. Some of this gas was cast off from its equator at a relatively slow speed, perhaps as low as 32 000 kilometres per hour, creating the doughnut-shaped ring. Other gas was ejected perpendicular to the ring at higher speeds, producing the elongated "wings" of the butterfly-shaped structure. 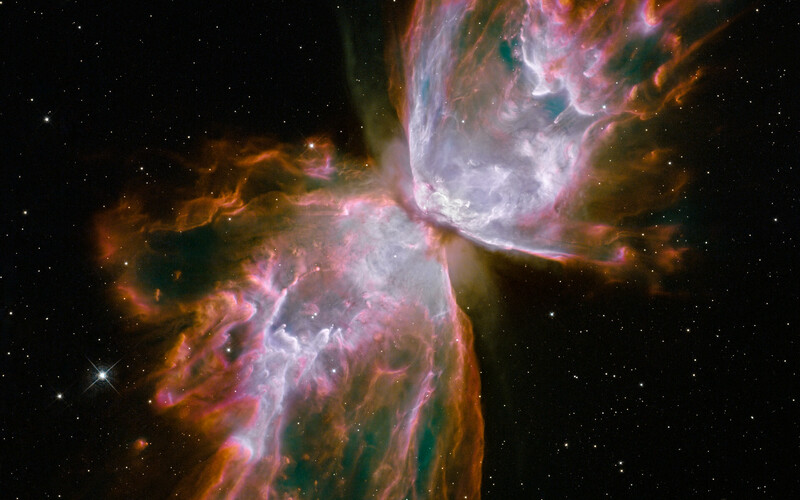 Later, as the central star heated up, a much faster stellar wind, a stream of charged particles travelling at more than 3.2 million kilometres per hour, ploughed through the existing wing-shaped structure, further modifying its shape. The nebula's reddish outer edges are largely due to light emitted by nitrogen, which marks the coolest gas visible in the picture. WFC3 is equipped with a wide variety of filters that isolate light emitted by various chemical elements, allowing astronomers to infer properties of the nebular gas, such as its temperature, density and composition. The white-coloured regions are areas where light is emitted by sulphur. These are regions where fast-moving gas overtakes and collides with slow-moving gas that left the star at an earlier time, producing shock waves in the gas (the bright white edges on the sides facing the central star). The white blob with the crisp edge at upper right is an example of one of those shock waves. NGC 6302 was imaged on 27 July 2009 with Hubble's Wide Field Camera 3 in ultraviolet and visible light. Filters that isolate emissions from oxygen, helium, hydrogen, nitrogen and sulphur from the planetary nebula were used to create this composite image. Position (Dec): -37° 6' 12.51"